Eleanor Roosevelt’s book on citizenship for young people now revised and updated for a contemporary audience. In the voice of one of the most iconic and beloved political figures of the twentieth century comes a book on citizenship for the future voters of the twenty-first century. 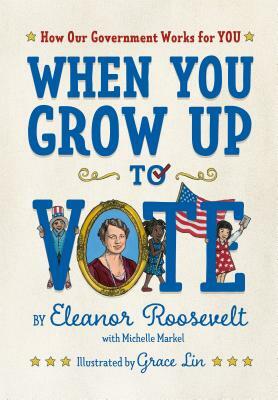 Eleanor Roosevelt published the original edition of When You Grow Up to Vote in 1932, the same year her husband was elected president. The new edition has updated information and back matter as well as fresh, bold art from award-winning artist Grace Lin. Beginning with government workers like firefighters and garbage collectors, and moving up through local government to the national stage, this book explains that the people in government work the voter. Eleanor Roosevelt was the First Lady of the United States from 1933 to 1945. She also served as First Lady of New York, on the United Nations Commission on Human Rights, and on the Presidential Commission on the Status of Women. She died in 1962. Michelle Markel is a former freelance journalist who has written many picture books for children, including Brave Girl: Clara and the Shirtwaist Makers’ Strike of 1909 and Hillary Rodham Clinton: Some Girls Are Born to Lead. She lives with her husband and two daughtersin Los Angeles, California. Grace Lin is a New York Times bestselling author and illustrator of picture books, early readers and middle grade novels. Lin's novels Where the Mountain Meets the Moon and Dumpling Days both received Newbery Honors, and her early reader Ling and Ting received the Theodor Geisel Honor. The cover illustration for her novel When the Sea Turned Silver (a National Book Award Finalist) was displayed at the White House, where Lin was recognized as a Champion of Change for Asian American and Pacific Islander Art and Storytelling. Many of Lin's books are about the Asian-American experience because she believes, "Books erase bias, they make the uncommon everyday, and the mundane exotic. A book makes all cultures universal."